Do you love your office supplies and gadgets? Have a complete wardrobe of purses and bags for every occasion? Want to be on the cutting edge of travel apparel? Look no further! In a related post from last summer, here is Debbie Miller demonstrating an iPhone app. 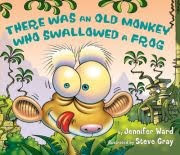 I received a copy of the new book, I KNOW AN OLD MONKEY WHO SWALLOWED A FROG by Jennifer Ward from the publisher, Marshall Cavendish, and I am so excited about it! I love versions of this fun song! And this new one is especially fun. The book takes place in the rain forest and the monkey is quite amusing. I love his facial expressions throughout the book when he is deciding what to eat next. This monkey definitely has personality. He never gets that miserable face that shows he has had too much to eat! He eats mostly animals--things like frogs, sloths, and tapirs. But he also eats things like cocoa (to sweeten the frog). I am excited to add this book to the shelf in the library. I think this is the perfect book for read aloud, to add to a basket of song books, to support new readers who are already familiar with the original story, and more. This is a really fun and well-done version of a favorite cumulative tale. I reviewed another of Jennifer Ward's books last year, THE BUSY TREE. And, I noticed on Jennifer Ward's site, that she has an upcoming book (2011) called THERE WAS AN ODD PRINCESS WHO SWALLOWED A PEA--really, one of my favorite stories in this format. I can't wait to see what she's done! I participated in the ALL WRITE!!! Consortium Summer Institute last week in Shipshewana, Indiana. It was a great event with almost 500 teachers participating. I had a great time with the teachers and also had a chance to spend time with friends. Pictured above are Smokey Daniels, Sarah Weeks, Lester Laminack and Sharon Taberski. I was able to hear Katie Wood Ray's keynote address as well as Smokey Daniels' session on Inquiry Circles in Grades 4-8. And, I had never met Sarah Weeks and I am a big fan of her work, so that was a treat! It was fun to chat with Sarah because I had just read her new book AS SIMPLE AS IT SEEMS on the way to Shipshewana. It is a great middle great read and it was so fun to meet the author on the day I read the book! There was also lots of informal chat. I was inspired by the whole day. I also got to see Ruth of Two Writing Teachers very briefly (just long enough to say hello). It is so funny to see her away from Stacey! I think of them as a blog duo and forget that they are 565 miles apart! It was fun to be part of one of her events! Katie's opening keynote was titled, "Refelctions on Loving Writers and Writing". I knew from the title that it would be an inspiring talk. Katie is always brilliant and always regrounds me. Her talk focused on her own teaching of writing and the writers she knows and loves. She reminded us of the importance of knowing lots of writers so we can bring those writers to our students. Watching her writing conferences is always amazing--the way she talks to students and the writing they produce because of the way she empowers them is inspiring. I am anxious to read her new book IN PICTURES AND IN WORDS! Then I attended the session on Inquiry Circles by Smokey Daniels. The new book, COMPREHENSION AND COLLABORATION: INQUIRY CIRCLES IN ACTION is one that I have been reading and rereading, thinking about what is possible in the library. I have always been a fan of the work of Daniels and Harvey. And I think this new book on Inquiry Circles may be a new favorite. In his session, Daniels talked about the four types of inquiry circles. He began by talking about Min-Inquiries. I loved what he said about these as a way for us, as teachers, to train ourselves to stop and notices kids' amazing questions and to honor their curiosities. He also talked about Curricular Inquiries, Open Inquiries, and Lit Circle Inquiries. We saw some video clips of some 5th graders talking about their lingering questions. Daniels reminded us that instead of projects or trying to decide what kids should "do" When they finish a book, he said, "We should be asking them --'So what? Now what do you wonder about'". After the session, I asked Smokey if he'd be up for a blog interview around the topic of inquiry circles and he's agreed. So, look for a blog interview by Daniels and Harvey later this summer. I didn't get to hear Sharon or Lester but did get to hear about their upcoming books. Lester has several coming out in the next few years. I can't wait to see his upcoming picture books. I love all of his books. Sharon has an upcoming book on K-3 comprehension coming out in the fall. Her first book, ON SOLID GROUND has been such an anchor book for so many of us. I can't wait to get my hands on this new one! Even though I was only in Shipshewana for less than 24 hours, it was a great day. The organizers of the conference put together such a great event for teachers. I am hoping that one of these years, I can attend since it is not that far away from home. The title of my photograph is "Butterfly Bush -- UR Doin' It Right." Franki and I are working together today, leading a Choice Literacy day of fun and books. 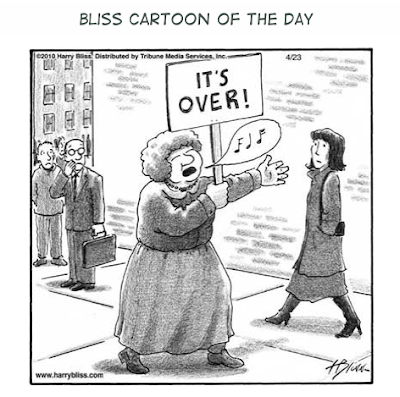 Amy has the Poetry Friday roundup at the art of irreverence. There's a special relationship between a grandparent and grandchild. If you didn't already know that, you wouldn't need the simple text in this book to tell you -- you would only need to look at the pictures. Love and encouragement and pride and hope for the future radiate from every picture on every page in this book -- pictures of grandparents and grandchildren from around the world (each labeled with the country) playing, telling stories, talking, hugging, laughing, making things, doing things. There is so much to talk about with children as you read this book and look at the pictures over and over again (because I dare you to only look through this book once): family, culture, tradition, memories, and more. This book could inspire children to create their own simple photographic essay about a topic that matters most to them. I recently watched a friend's 14 month-old baby sort through her basket of board books while her mom and I chatted. She looked at each one, sometimes stopping to open a book to a favorite page and point to a picture and say something to herself. An independent reader who is not even 2 years old! One of her favorite words to say is BABY, so I know she would love this board book. Every page has a happy, sad, serious or eager baby looking out at you. There are babies with blond hair, red hair, curly hair, black hair, pig-tailed hair and no hair. There are babies with every shade of skin and every shape of eye. There are spring, summer, fall and winter babies. Add this one to your list of favorites for baby shower gifts! Just when you think you have enough dog books, you come across another great one that you must have! No matter how many dog books I have--fiction, nonfiction, poetry, etc.--it is hard to keep up in the library. Kids love dog books. The new one I picked up is called PLEASE TAKE ME FOR A WALK by Susan Gal. This book is about an adorable little dog who wants to go for a walk. The text is simple-one line per page. The dog is begging to be taken for a walk and he has lots of reasons for wanting to do so-he wants to see his friends, catch a ball, meet other dogs and more. The repeated phrase "Please take me for a walk" comes up often, each time followed by a good reason or two. The illustrations in this book are happy and fun. I immediately saw lots of reasons to buy this book. First of all, it is a fun story and I am sure it will be checked out often. It is very supportive of newer readers. One line of text on a page, picture support and a good font--I think first graders will love reading this one on their own at some point in the year. Finally, I love that the dog is narrating the story. I can see it used as a mentor text for kids trying to write from another point of view. 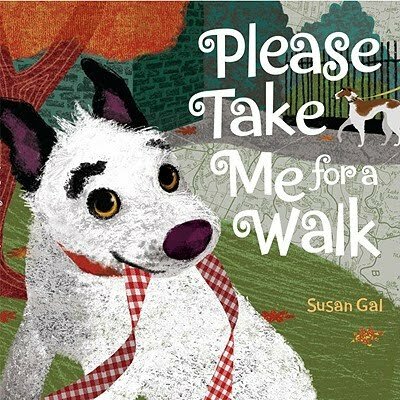 This would be a great book to use to introduce the concept of first person voice--older kids will enjoy the dog and his pleading for a walk. The narrator has definitely perfected a puppy voice. This is not a book to take off the shelf once in the spring before state tests to "teach" metaphors. True, the text is a lyrical series of metaphors about hope. However, the strength of the book lies in the photographs and in the explanation of the photos in the back of the book. There are pictures of children from Alabama and New Orleans who lost their homes to Hurricane Katrina, children from Sri Lanka whose school was washed away by the tsunami in 2004, children from East Timor who have lived with political violence, and children from Haiti who lost everything to the recent earthquake. With images and information in the media about the ever-spreading oil spill in the Gulf, we will need to be ready to have lots of conversations with our students about hope, and about the things they can do to make a difference. The blog ripple, begun on June 3, 2010, has this mission: "A small sketch -- a small donation -- each small act helps. Together we can cause a ripple in the oil soaked waters of the gulf." Read artist Kelly Light's first post and complete mission statement, and think about the kinds of small ripples you (and your students) can make so that you don't simply feel hopeless or disconnected from this disaster that will ultimately touch all of our lives in some way. 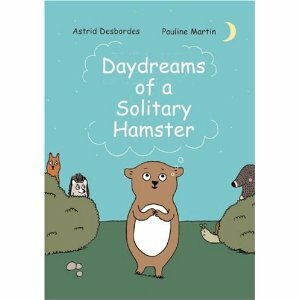 I just discovered DAYDREAMS OF A SOLITARY HAMSTER and it is quite fun. I purchased it because I saw it described as a graphic novel, but it is actually several separate comic strips put together in a book. This is a picture book size book and includes several stories about Hamster and his friends. Most strips are simple stories that take up the two page spread. The characters are quite amusing and the more you read, the more you come to know each one. I like a lot about this book. First of all, I like that is is several short comics. They are simple and fun and each provides something to talk about. I am always looking for short pieces to use in minilessons, book clubs, etc, and it is difficult to find these in graphic form. But this one will work well for many purposes. The fact that there are many stories about these characters will allow kids to really come to know them. I love the illustration and the size of this one. Kids are loving this graphic format, but so many graphic novels/books are not appropriate for younger children and they are dying to read them. This one would definitely work for young readers and it is fun enough to engage older elementary reader as well. I think the thing I love most about it is the huge range of readers that will be engaged by it. You thought you knew all there was to know about princesses because you've read every version of Cinderella, Snow White and Rapunzel? Well, think again. You've never met Princess Somnia who sleeps, Princess Paige who reads, or Princess Molly Coddle who is spoiled (plus more than a dozen others). This book is equal parts parody and word play. It fits into the category of books that work really hard to look like nonfiction even though the topic is fictional -- this one has definitions, diagrams, cross-references, charts, graphs, tables, a glossary, a bibliography, an index, a list of proverbs and a test you can take to find out what kind of princess you are. It's a GORGEOUS book -- oversized with red and pink as the dominant color-scheme -- and there is so much to look at on every page, complicated by the cross-references from one princess to another, that it is more of a book for browsing than reading straight through cover to cover. One of the joys of this book lies in the diversity of the princesses. They come in a variety of sizes, shapes, skin colors and cultures. (There is even one princess who is a prince.) They have incredibly unique talents and personalities...just like the reader, who is encouraged to find someone familiar (perhaps yourself?) in these princesses. This book is for older readers (sophisticated humor and high level vocabulary), for anyone passionate about princesses, and even for readers who aren't really all that into princesses, but who appreciate humor and creativity no matter what the topic. 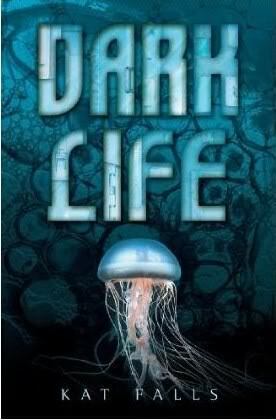 I read DARK LIFE by Kat Falls this week while traveling and I really enjoyed it. It is definitely science-fiction/fantasy. It is a futuristic story of a city under the sea. Because land is scarce, people are packed in on the earth. Ty is sixteen years old and is one of the few children that has been raised in the ocean. Early in the story, Ty meets Gemma, who lives "Topside" but has come under sea to look for her older brother. They have quite an adventure. It seems that outlaws are attacking the undersea community and chaos is part of daily life. It is up to the citizens of the city to find the outlaws. Ty and Gemma get involved in the search and face many dangerous situations. One thread throughout the book is the idea of "dark gifts". Some people believe that children who were born and raised under water have unnatural gifts due to the water pressure. Ty denies having one of these "gifts" as do the other character. This is a thread that comes up throughout the story. Overall, a really good book. A great book for kids who have read and enjoyed the City of Ember series and a great one to stretch kids who love fantasy, adventure, and survival stories. Books with rhythm and rhyme--books that are fun for young children--are some of my favorite books. 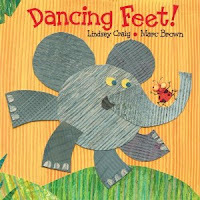 Sally, at Cover to Cover, shared DANCING FEET by Lindsey Craig with me during my recent Cover to Cover visit. It is great fun and so much for young readers to love. First of all, this is a fun, rhythmic book. One of my favorite books is TANKA TANKA SKUNK. This one has that same feel for me. There is fun with words, sounds and rhythm. This is definitely a book that kids will want to join in for--it asks to be read together. The next page answers the riddle with a chant in the same rhythm and an accompanying illustrations. I LOVE LOVE LOVE the illustrations in this book. They are made with cut paper--you can see that the illustrator, Marc Brown, used several textures. This is a new type of art for Marc Brown and I LOVE it! Looking more closely at it as I write this, I am thinking that this may be on my short list of Caldecott hopefuls. The illustrations are definitely engaging, colorful and unique. I like the switch to a one-a-day commitment. If I try to do one new thing each day all summer, maybe I'll keep doing that one thing the rest of the year. ...or not. A poem a day in April didn't stick...but that's what made April special, so I'm okay with that. Donalyn is still reading a book (or more) a day. Amy is still writing a poem (or more) a day. I am still writing a thank you note (or more) a day. Toby jumped right in and started taking a picture a day of the sky. Jone is writing a haiku a day. JoAnn is getting ready to move by giving something away every day. TinyReader and Baby Lily are reading a book (or more) a day. Mandy is playing a game a day with one or two or all three of her kids. Carina is going to try to get outside for some unscheduled time every day...just to be outside! InNeedOfChocolate intends to do some yoga every day. What have you vowed to do once-a-day each day this summer? 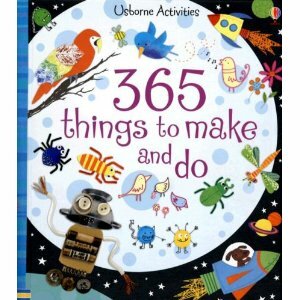 Yesterday, I made my first summer purchase for the library--365 THINGS TO MAKE AND DO. This is not a new book, but it is new to me and will be new to the students. Cookbooks and Craft books are quite popular in our school library. And I think they are critical pieces to a good collection. I think "how to" reading is important, especially as our kids grow as readers. Knowing how to read this type of writing as well as reading the visuals that go along with it, goes a long way toward the visual literacy skills we want for kids. I worry that sometimes, when we are talking about skills like visual literacy, we automatically think about technology tools. But I think our young children can begin to understand visuals in ways that make sense for them. One way is through books like this. This book is definitely visually appealing. It is a large book --it has to be in order to fit 365 ideas in it! This is not really 365 different ideas. The book is divided into about 125 projects. Each project idea is shared on a two-page spread. For example, one page deals with "Pretty Masks". The page shares the steps to make the mask in a step-by-step column. Then a variety of samples are shared. (Each of these counts as one of the 365 things in the book.). I love creation and I think kids do too. My daughter recently started her own blog called FUN THINGS TO MAKE. (Her review of the book is here.) When she has free time, making things is often her activity of choice. And she makes things with a variety of tools. She has a cabinet full of "stuff" and the process of creativity is fun to watch, as a mom. The thing is, she creates with pipe cleaners with the same thoughtfulness that she uses when creating with tools of technology. I love to watch her when we shop at the Craft Store--she is shopping for possibilities, more than for things. Looking around to see what is possible. As much as I think it is so important that our kids be creators of information and creators with tools of technology, I also think it is important that they create lots of things with lots of stuff. I have been thinking about this a lot since spending time on children author, Amy Krouse Rosenthal's site. Her home page says, "Amy Krouse Rosenthal is a person who likes to make things." I so love this. A clip that really got me thinking about creation was her film called "17 Things I Made". Watch it if you have time. For Amy, it seems that she too likes creating a variety of things. When I think about the big 21st Century skills, creation is key. I worry about creation being seen as fluff and that our kids are not having time to create and enjoy the process of creation in school. I am not usually drawn to books like this--a craft that kids make where the child's product looks like the example. 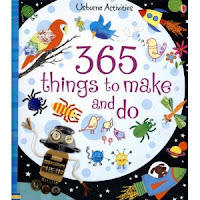 But I see this book as an invitation to kids who love to create. Because each project idea has lots of samples and ways to use the idea, I feel like it just gives kids lots of new ideas for creation. A child might go to the masks page, figure out how to make the basic mask, look at the ideas and try a mask that is different from those shown. Or a child may try one of these exactly as-is to learn the technique (painted papers) and then use the technique in a future project. Just like writers might try new things out that they see other writers use, I think creators of anything do this same thing. I love this as a great invitation for kids--one that shouts out, "Look What is Possible! Give it a Try!". I am trying to figure out how to make this kind of creation a more standard part of the library--having not only the technology tools to create with but also tools like these--paint, paper, etc. for kids to create ways to share learning and information. Such an important piece to children's whole development. I am all about finding great downloadable songs for kids these days. So imagine my happiness when I spotted PERFECT PIGGIES! by Sandra Boynton on the Cover to Cover counter. I could tell by reading it that this would be a fun song and was thrilled when I got home and listened to it. I have found quite a collection of great songs and sites that support songs and literacy. One of my other new favorites, that I wrote about recently is PETE THE CAT by Eric Litwin--another book with a downloadable song. I love the live performance and the kids love it too. Once I found PETE THE CAT, I found others by Mr. Eric. Another new favorite is MR. ERIC'S JUMPING SONG. You can see the lyrics (and hopefully soon, a video) at THE LEARNING GROOVE. The Elephant Song is another of my favorites. I wrote about some songs last year for a Poetry Friday celebration. I wrote about some of these songs when kids were working with Garage Band in the library. I am also thinking about all of the possibilities for our K-1 readers. Having a great variety of songs and text available is so important. I always had a song book basket when I taught K-1 but having access to these on computers and iPods will be so great for kids. I am starting to see how this technology is going to change the way kids experience so many kinds of text. I love that the list of great downloadable songs for kids is growing. And I love the books, like PERFECT PIGGIES and PETE THE CAT, that give us a downloadable song to go along with the book. I'm looking for more of these. Yesterday, several of us got together at Katie's house. I can't tell you how nice it was to get together at a house. There is something about sitting around, sharing, chatting, snacking and learning that happens when we are at someone's house. There were teachers there from several schools in and out of our district and we spent a bit of time introducing ourselves and sharing where we were, goals, etc. Each piece that was shared started a great conversation. Honestly, I can't say that I learned a tool or came away with something I could "Do" today. Instead, it was an inspiring evening with some of my favorite people, talking and learning together. Sharing our successes as well as the challenges of all of this in a comfortable group of learners--how could you beat that? As an elementary librarian, I have discovered that one of the most important things I can do to support students and teachers is to be a user of many of the new tools for learning. If I am a user of these tools, I have a better menu of options when working with students, collaborating with teachers, etc. Work on the library website and create something that I can build on throughout the year. Learn how to edit movies more efficiently. Use a few new tools like Scratch, Flickr, Googlemaps, etc. I am upgrading my iPhone and getting a new iPad so that will be lots of new learning for me. 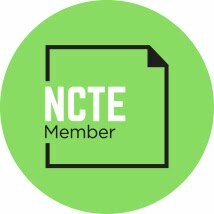 I found this great link today at Edudemic--sharing 100 great tools and I think it will be my starting point for learning. I want to give myself reasons to use some of these tools for my own learning. I want to see what it is these tools can do. I'm not sure which ones I'll start with but there are certainly plenty of options! I am looking forward to the next get-together with this group of friends in early July. After that, I'll be attending November Learning BLC and I am sure I'll learn a ton there. So, yesterday's get-together was perfect for me. I feel ready to tackle some new personal learning--excited about the possibilities and happy to have such a great group of people to learn with. 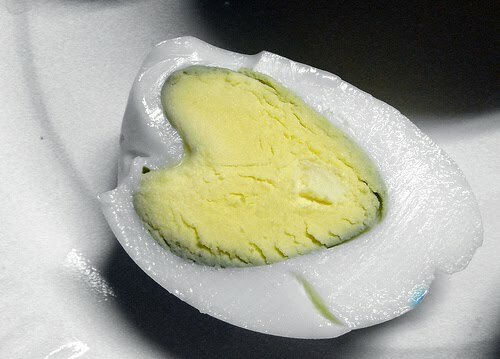 For more perfectly boiled poems (with salt), you'll find the roundup at Two Writing Teachers. Speaking of roundups, the code for July-December is complete. Let me know if you'd like me to send it to you so you can have the roundup schedule on your blog. Last week, at our Cover to Cover visit, Sally handed me an ARC of WHAT HAPPENED ON FOX STREET by Tricia Springstubb. I hadn't planned on reading it right away-my stack is huge. But I did. I finished it this morning and thoroughly enjoyed it. Thinking back on the book now that I have finished it, it is all about the characters. The people on Fox Street will live with me for a very long time. Mo Wren, her little sister and her father live on a house on Fox Street. She has always lived there. The street is one with many people who have watched Mo and her sister grow up. People she counts on. But the family is dealing with grief--the loss of Mo's mother a few years back. This is the story of Mo and her family and friends and holding on to what she can and letting go of other things. "Every person you pass on the street, or wait behind in line, or see sitting alone on her porch-every one is summoning up the courage for some battle, whether you can see it or not." This is a quiet book--seems to have the feel of a safe street with neighbors you trust. But there are so many little things to think about. Mo Wren is a thinker--she thinks a lot. And as a reader, I found myself doing a lot of thinking too--issues of grief, hope, family, race, betrayal and more come up. But they are quiet issues--they happen in the book as they happen in real life--as part of ordinary days. 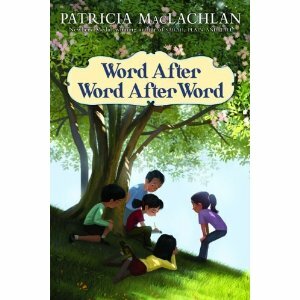 I can see this as a read aloud or a book talk book for older elementary kids. Definitely glad I made the time to read this one. My fourth graders love reading the advice in the regular and extreme editions of the Junior Worst-Case Scenario Survival Handbooks, so I'm sure they'll love this one, too. In this edition, readers receive handy advice on how to deal with aliens, monsters, hauntings, time travel, and magic and myth. I went straight to the time travel section to learn what to take (gold, snacks, a water purifier and a first-aid kit, among other essentials), how to survive in ancient times (eat gingko nuts in dino times, take toilet paper to ancient Rome, shave your head in ancient Egypt, and don't bother jousting in Medieval times) and what to ask your future self (What's the most important lesson I've learned?). This fun parody of advice writing would make a great mentor text. It would also be fun to frame research writing in a how-to-survive format. It's been a while since we've added a new teacher to our list of Cool Teachers in Children's Literature. When we started the list, in the summer of 2006, we were hoping to collect a list of 100 Cool Teachers. We are now up to 130 teachers!! The list is in alphabetical order by author's last name. "Ms. Lilly is insightful and wise. I love these two bits of advice she gives Noonie; 'artists have the power to change the world' and 'sometimes artist block is a good thing.' Ms. Lilly is also instrumental in showing Noonie it's okay to carry around a mentor text, the Masterpiece, it's a collection of different artist Noonie refers to constantly while she thinks about her own art. Ms. Lilly guides Noonie at the end showing her how to accept her journey and life." Have there been any cool teachers in the books you've read recently? Okay, so I have never done this--put a book on the BOOKS I COULD READ A MILLION TIMES list, before I actually read it to many, many classes. But I am soooo confident about this one, that I thought I'd go ahead and add it to the list. I have absolutely no doubt that this book is worthy of the list. I plan to read it at least a million times over the next few years and I am absolutely positive that I will never tire of it. 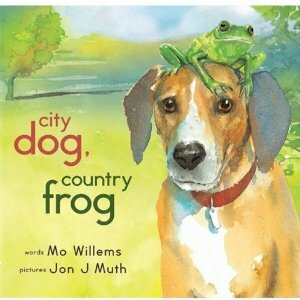 CITY DOG, COUNTRY FROG by Mo Willems definitely fits my "Books I Could Read a Million Times" criteria. I was a little hesitant about this book when I read about it. I love Mo Willems. I love Pigeon and Piggie and Elephant. I love all that he does. I love how his writing and illustrations work together. So, I couldn't imagine a book by Mo Willems that was illustrated by someone else. And I could tell by the look of this one, that it was a different kind of book for Mo Willems. I should have known better than to worry. Mo's work has never let us down. I have loved every one of his books and this one is definitely one of my favorites. Although the story is a bit more serious than some of his others, it is really not so different. As always, Mo Willems deals with life's issues in a way that works for young children. This is a more serious book than some of Mo Willems' others. It is about two friends--a city dog and a country frog. They love to be together and to share their lives with each other. They play during spring and summer. But then in fall, frog is too tired to play so they enjoy each other's company in other ways. When winter comes, frog is no longer there. Mo knows young children so well, that he writes this story of friendship and grief in a way that works for any age. He reminds us that those we love are always with us in some way. And Jon J. Muth's illustrations are a perfect match. I couldn't imagine illustrations that capture the story any better. There is a great deal of depth to this book. Readers can jump in at many levels--one of the reasons I am putting it on my list. So much about grief and seasons. So much about friendship and relationships. Mo Willems is brilliant about saying so much in so few words. I had a great few days in San Antonio with Choice Literacy. What a great group of teachers. I always learn so much when I work with teachers. It was a great kickoff to summer. I also had a chance to see a show at the Majestic Theatre. What a gorgeous theatre. If you ever have a chance to see a show there, you should! I also had some time to spend with friends--Brenda Power, the 2 Sisters, and my new friend, Trish. My new friend Trish, an amazing teacher in Texas, made these VERY FUN centerpieces for the" Delight in Words" workshop. She set these up the night before and they brought a great energy to the room. They were quite fun and the base as well as the dots placed around the table made for a happy day. I am thinking about using something like this in the library. I have to figure out exactly how to do it, but wouldn't they be great for advertising new books, sharing books that kids might like if they liked other books, one with all of the books in a series, etc. I can see them placed on tables, shelves, etc. I know these took Trish hours and hours and hours to make but they made such a difference in the room. As I continue to think about the environment I am creating, it is these little touches that make all of the difference. I find it a bit more difficult to do this in the library because it is a K-5/whole school space, but these centerpieces definitely got me thinking about little touches that make a big differences. A hymn of praise to God sung as part of a liturgy. 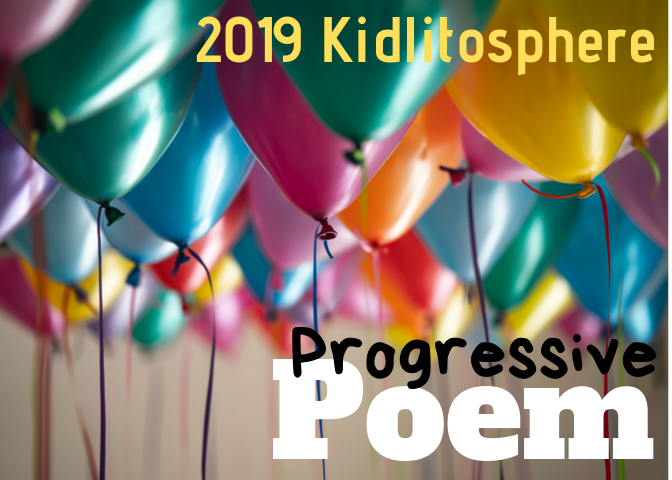 Today, Kelly Polark has the Poetry Friday roundup. Speaking of roundups, we're getting close to the end of our schedule. So close, in fact, that a couple of people have already stepped up for August (which, as teachers know, will be here before we blink so we need to live for today/te deum/carpe diem). If you'd like to host one of the remaining 2010 round ups, let me know in the comments which week works for you (or by email at mlhahn AT earthlink DOT net). Once the schedule is set, all you have to do is ask for the html code so that you, too, can post the schedule in your sidebar. The father of one of my math students was amused by the fact that my last name is same as the evil crime boss guy in the Bruce Lee classic kung fu movie "Enter the Dragon." He was so amused that he sent the movie in with his son for me to bring home and watch. Which I did, but mostly because I live with someone who is, if not a kung fu movie expert, at least someone who has watched enough of them to walk me through the hallmarks of the genre. All of that by way of saying that if you've watched just ONE kung fu movie (or probably just one episode of any Saturday morning ninja cartoons) this book will be so funny you will start quoting out loud from it after only a few pages. "Danny sighed. Pepperoni pizza was a good thing--possibly a great thing--but not as awesome as kung fu movies. Hardly anything was. Still, he couldn't be too upset. Seven Fists of Carnage was going to be on tonight. He hoped it was as good as his all-time favorite, Vengeance of the Thirteen Masters, in which a blind salamander samurai fights off thirteen ninja clans, using only a pair of chopsticks. Danny passed the time until the pizza arrived by drawing ninjas. Drawing ninjas was difficult because you couldn't really see a ninja. So the drawings mostly consisted of places where ninjas might be hiding." Suki, the Japanese exchange student who complicates things by being a girl, is being attacked by ninja frogs. She doesn't even believe in ninjas, but since they're "practically mythological," they're right up Danny's alley, seeing as he's a dragon. Danny, his friend Wendell, and Suki set out to get to the bottom of why the ninjas are so interested in Suki. They take the bus (the same one that took them to the Sargasso Sea in the first book) to mythological Japan where Danny's great-grandfather lives, and where they learn that Suki must choose between becoming a veterinarian and the leader of an underground ninja clan. Wendell: "Do you ever worry that your childhood is warping you in some fashion?" Danny: "Are you kidding? I'm counting on it." YAY! The potato salad that slunk into the storm sewer in the first book comes back to save the day in this one! Wendell is bit by his school cafeteria hot dog and starts growing hair on his back. A quick trip into the cafeteria's freezer reveals that some of the hot dogs served were Were-Wieners, a product of Transylvania. Unfortunately, Danny doesn't have any relatives there, so they can't take the bus this time. Even though "Calling the company did not hold the same appeal as storming a factory in the vampire-ridden Carpathians," Wendell calls the number listed on the package where "It says 'In case of missing product, damage or lycanthropy, call 1-800-WURST-R-US' " and learns that they must kill the alpha wurst so that the rest of were-wieners lose their power and Wendell can be restored to normal. Either I'm channeling my inner fourth grader, or I'm simply relaxed enough after only a couple of days of vacation to get my sense of humor back (or both) but this series is turning out to be one of my all-time favorites. I read the first book in this new series, FRANKLY, FRANNIE, last night and laughed out loud. 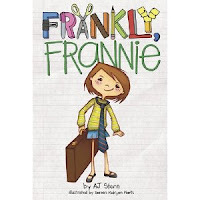 Frannie is a funny new character who wants to be a grown-up. She carries a briefcase and a resume, loves offices and for Christmas last year, she asked for "an assistant". She is a hoot. But everyone doesn't agree that Frannie is so amusing. She seems to get in trouble quite a bit and seems to need extra supervision. But her heart is always in the right place. In this first book, Frannie's class goes to visit the radio station. But when the phone rings and no one is at the radio desk, Frannie comes to the rescue--or at least that's how she sees it. In trying to help out and trying to be a grown-up, Frannie causes lots of problems. Frannie was a mix between Clementine, Roscoe Riley, Junie B. and all of the other spunky characters who seem to get in trouble when they are really just trying to help out. I liked the ending of this one--Frannie apologizes to the people who were impacted and they see the good in Frannie. She also knows that she did the right thing. I think kids will really like this series. I always love to see new series for transitional readers and this is a fun one--looks like there are 2 out now and one more coming in September. I think this is a great book for kids newer to chapter books but the humor also makes it a good choice for older kids who are looking for a fun read. Donalyn's going to read a book a day. I'm thinking about writing a thank you note a day. What will you do once a day all summer long? A history of flight, told in poems! Brilliant! Lewis begins with Icarus, then treats us to three versions of the hot air balloon. He includes ideas that didn't work so well (Ornithopter and Multiplane) and others whose time was brief but brilliant (Zeppelin and Bell Rocket Belt). He ends with the Nighthawk and the Space Shuttle, but a canny reader will realize that with a history like this, it's likely that humans haven't run out of ideas for new ways to take to the sky. Endnotes give a little more information about each of the airplanes/modes of flight, and a final timeline gives a tidbit of non-flight history for each of the years in which flight history was featured in a poem. The poems are clever and snappy -- the Ornithopter got a double limerick and the Concorde's poem is shaped like the plane -- and this book is another great example of multi-genre writing, with its blend of history and poetry. I so love the first days of summer vacation as a reader. I love looking ahead to some extra reading time. For the last few years, Mother Reader's 48 Hour Challenge has been at the very beginning of summer vacation for many of us. Although it has not been timed right for me to participate fully in the challenge, I love the 48 Hour Read and participate in other ways as a reader. Today, the Central Ohio Bloggers celebrated the 48 Hour Read by getting together for breakfast and a bit of book shopping. I took this trip as an opportunity to set up my next few weeks of reading. Sally, at Cover to Cover, is always so wonderful about sharing ARCs with us and we are all pretty good about sharing the ARCs with each other. We all leave the store with great piles. I find shopping for books to be as fun as reading them. I have several plane trips coming up so I am hoping to get lots of these read in the next few weeks. Here is what I left the store with. 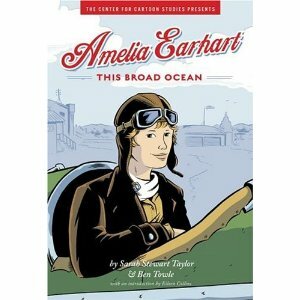 I was excited to pick up a copy of AMELIA EARHART: THIS BROAD OCEAN by Sarah Stewart Taylor and Ben Towle. This book was actually released in February but I hadn't seen it. A graphic novel biography of Amelia Earhart. If you read the Satchel Paige graphic novel/biography, this one is very similar. 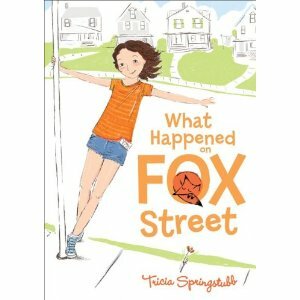 I also received a copy of WHAT HAPPENED ON FOX STREET by Tricia Springstubb. This book is due out in August and it looks amazing. I hadn't heard about it and am so happy that Sally pointed it out to me. From the back cover, it looks like this is a book about grief and growing up. I read the first paragraph and loved it immediately. And the author is from Ohio. I am very excited to have discovered this one today. CANDY FAIRIES by Helen Perelman looks like a series that will appeal to all of my Rainbow Fairies fans at school. Love the idea of candy fairies, especially Cocoa, the chocolate fairy. This looks like a fun series. Each book is a little longer than the Rainbow Fairy books so it might be good as those readers once they move beyond those books. I was very excited to see the FRANKLY, FRANNIE series. I am always on the lookout for new series books. And, I must say, there are very few characters in children's books with a name like Franki, Frannie, Frances, etc. The cover is definitely engaging and I was happy to see two books already available in this series. From what I can tell, this is another series about a spunky, independent girl. You can never have too many of those. Two books that I am VERY excited about are AS EASY AS FALLING OFF THE FACE OF THE EARTH by Lynne Rae Perkins and KEEPER by Kathi Appelt. Mary Lee says it is her favorite novel of the year and Monica Edinger reviewed it for the NY Times this week. Sally suggested WORD AFTER WORD AFTER WORD by Patricia MacLachlan to me and Mary Lee agreed that it is a great one. I wasn't even aware that MacLachlan had a new book out and she is one of my all-time favorites. I am sure I will love it. I also picked up Andrew Clements' new series BENJAMIN PRATT AND THE KEEPERS OF THE SCHOOL: WE THE CHILDREN. Kids seem to love everything by Andrew Clements and this looks like something a bit different for him. Still a school story and with a great premise. I was happy to see a new Loud Boy book. DANIEL BOOM AKA LOUD BOY: GROW UP by D. J. Steinberg looks like another that kids will love. I am happy that so many graphic novels are becoming series. This will be a great support for readers--having characters they can read about again and again. Daniel Boom is definitely a character that kids enjoy. 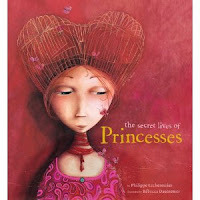 THE SECRET LIVES OF PRINCESSES by Philippe Lechermeir is one I've read about on several blogs. I thought it would be a great one to add to those princess books that I can't keep in the library but after buying it, I think the humor is definitely for an older crowd. I think some upper elementary kids will crack up at this one. Now if I can just find the time to read all of these before I add to the stack. 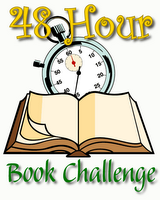 I did not officially take part in Mother Reader's 48 Hour Book Challenge. But I've participated in spirit. Today I spent 4 solid hours reading. As I promised myself, I re-read AS EASY AS FALLING OFF THE FACE OF THE EARTH. I loved it just as much the second time around. In the past 48 hours, I've celebrated the end of the school year with our staff and with close friends. I've napped (twice...hands down the most restorative thing I've done in the past 48 hours). I've weeded a bit, though the tomatoes still need to be staked. I've done a half-hearted job of cleaning the house and I've done a couple of loads of laundry. It feels so good to be released from the to-do lists that have been monopolizing my every waking moment for the past few weeks. Congratulations to those who have read, and blogged, and challenged themselves, and set and met goals. After sprinting and hurdling (hurtling?) over the finish line of the school year, what I needed most was to slow down and wander through a couple of days with no agenda. Mission accomplished. I was so excited to see a new novel by Jennifer Holm. I picked up TURTLE IN PARADISE and was so happy for the time this weekend to read it. I love Jennifer Holm and have loved all of her work so far. Who doesn't love Babymouse? And PENNY FROM HEAVEN made its way around my entire Italian family--mother, grandmother, aunts, etc. Jennifer Holm captures people and life in a way that is humorous, hopeful and real. TURTLE IN PARADISE is about a little girl named Turtle, who is sent by her mother to live with her aunt. This story takes place during the depression and Holm gives us more information at the end of the book about this era and that it was common for children to go live with relatives. Turtle is sent to Key West and gets to know her cousins and the neighborhood where her mother grew up. The characters in the book are quite fun. Bill Prosser at Literate Lives described them well--they have a bit of a Little Rascals feel to them. A group of lovable kids who seem to run the town and get in a bit of trouble here and there. Turtle fits right in, although that isn't clear to her at the beginning. And she grows up as she comes to know herself and her family. It is amazing to me how Jennifer Holm strings together a story of ordinary days to create something bigger. There is a calm rhythm to the story but you realize that in these ordinary days, Turtle is growing up. From the cover (which I LOVE! ), my first thought was that this was a beach book that would appeal mostly to girls. But this is a book that will appeal to a huge variety of readers. I can see it as a GREAT read aloud in 3, 4th or 5th grades. Much to talk and think about but in a way that is very accessible to kids. Such a variety of characters that everyone will find someone to cheer for. Love the book-so happy it was my first read of the summer! Again, totally amazed at the variety of writing that Jennifer Holm is able to do well. Poetry Friday -- She's Singing Today! And I was the gardener. I nourished your beauty and helped you grow. I valued you even when others thought you were wild weeds. 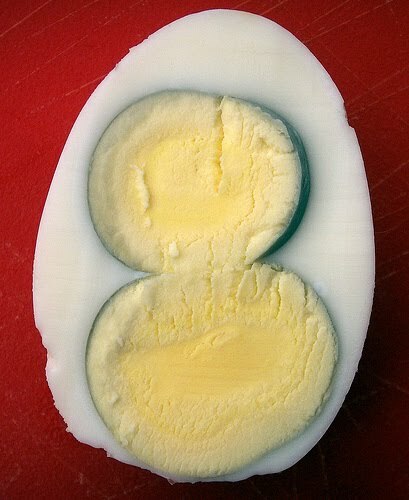 and lovely in its uniqueness. encourage the small and quiet ones to shine with brightness. Someone else will be your gardener now and forever more. The roundup today is at The Cazzy Files. I originally thought I'd go for all flowers this month. You know, the old, April showers bring May flowers sort of thing. 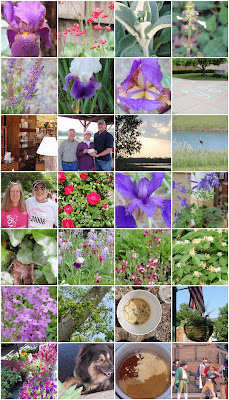 But although May did bring on lots of beautiful blooms (it seems like everything is a couple weeks early this year), it was good for more than just that. May brings Teacher Appreciation week, and our wonderful PTO went all out this year, including decorating the front walk with "thank you" in dozens of different languages -- perfect for our school. May brought the new/old cabinet for the kitchen (and hopefully June will bring the time for the floor, walls, and new appliances!!). COFF donated $1000 to CFR, and my Champion ran the Race for the Cure in celebration of me. My "Time With Teacher" in the raffle at our school's Carnapalooza was a river exploration program at Highbanks. My young friend and I didn't catch the water snake, but we were suitably impressed by it. Worthington has their flower baskets hung from all the light poles in Old Worthington. These baskets are a measure of my summer: right now the vines only come to the bottom of the baskets. By the middle of August, they will be touching the ground and it will be time to go back to school! 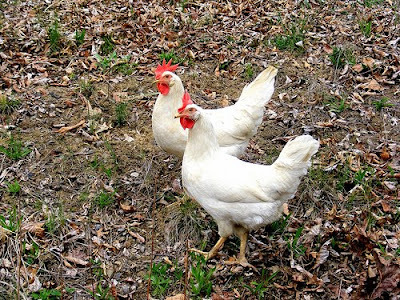 We finish the month with The Hosta Guy's dog under the van at the farmer's market, the spices I used for chicken curry, and Captain Flint (our favorite barista at Stauf's) in "Treasure Island." Fair warning: I'm going to gush. This is my favorite novel so far this year, hands-down, no competition. You read for characters? This book's got a full cast, but if I had to pick a favorite, it would be Del. I love Del. Who wouldn't? He drops everything to drive Ry across the country to get back home, and then flies in a duct taped airplane with him to an island, and sails with him to another island, only to have some rotten luck with a windmill, but luckily he's taught Ry everything he needs to know in order for complete his mission on his own and live the rest of his life wide open for possibilities the way Del does. The real reason I love Del? I'm married to him. To a man who can drive all night without sleep, find a way to fix anything (and who'll drop whatever he's doing to fix that thing for whoever asks), fly an airplane, sail a boat (while singing sea shanties), and admit (most of the time, at least begrudgingly) when he's wrong. My point here is not to gloat, but to let those of you who believe that Del is an over-the-top created-by-an-author kind of character know that men like that exist. Another reason I love Del? I've got a little Del in me, too. I've got a couple of summit photos to prove that prior to arthritis and back problems, I was a rock climber. I've swum two open water swims, driven around the U.S. on my own, learned to make bobbin lace, and baked over 100 cupcakes in 3 days straight. I've had an interesting life. I HAVE an interesting life. And if there's nothing else this book makes you want more than to start over again at page one and reread it, it makes you long for (or proud of) an interesting life. What else do I love about this book? The dogs. (They crack me up. Especially their conversation in the cargo hold on the way back home.) The chapter titles. Carl's driving. The description of the smell of the air in Florida. The scene where Everett's methane tank explodes. The way this book has stayed with me even though I finished it (for the first time) a week ago. What are you waiting for? Go get a copy and start reading. Now! Competition has been a big problem in my classroom this year. For a few of the kids, it's always a race to the door when they're called to line up, with no tolerance for someone getting their place back in line once the order is set. The drama of the soccer field at lunch recess lasts well into the afternoon, and both Connect 4 and Battleship were put away during indoor recess season because of constant (loud) bickering about who won or whose turn it was to play. Grades on papers are not seen as a reflection of one's hard work and progress in learning, rather they are numbers with which to "verse" one another. The set-up to the story is two little boys (sorry, guys, but yes, it's mostly your problem...) diving into a toy box and coming up with a shark and a train. The two toys go head-to-head in some situations where the winner is obvious -- in the ocean or on railroad tracks -- not so obvious -- roasting marshmallows or eating pies -- or downright tricky -- playing hide-and-seek or trying not to get shushed in the library. In this book, the escalated competition is preempted by a call to lunch. Hopefully, in my classroom next year, it can be preempted by a humorous look at competition from the first day. How the book came to be -- a peek behind the scenes by editor Alvina Ling at Blue Rose Girls. 7-Imp's chat with the author and illustrator.